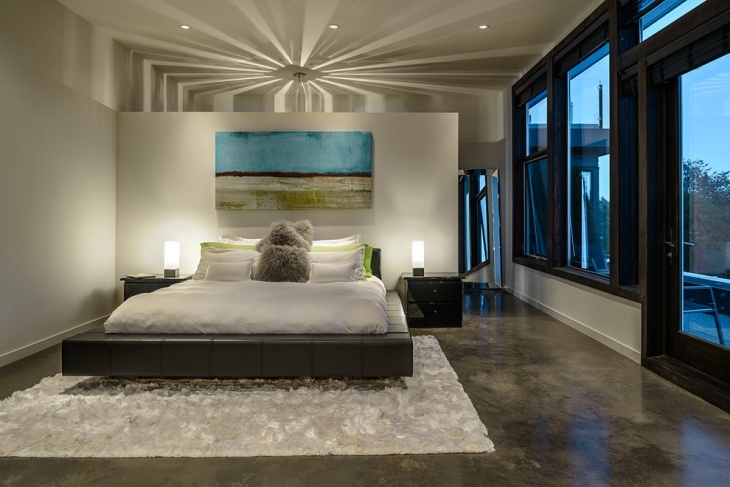 Concrete ceilings and concrete flooring in a bedroom make for an ultimately chic, sleek and stylish looking bedroom space. 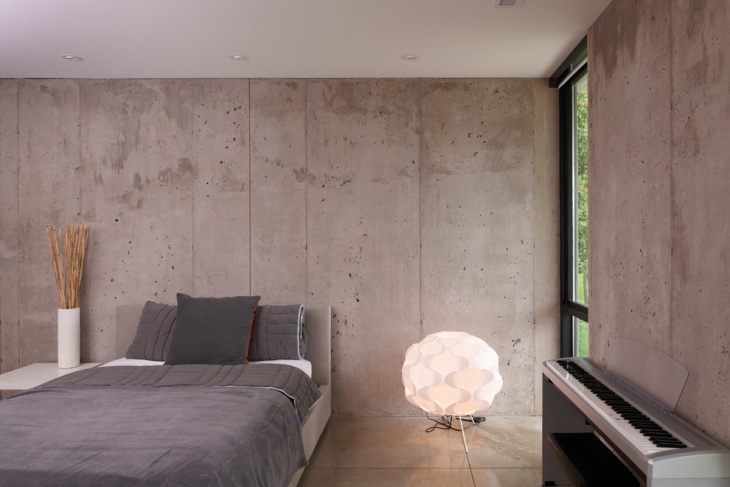 If you have a big house, concrete is just the right thing you can incorporate into your bedroom. 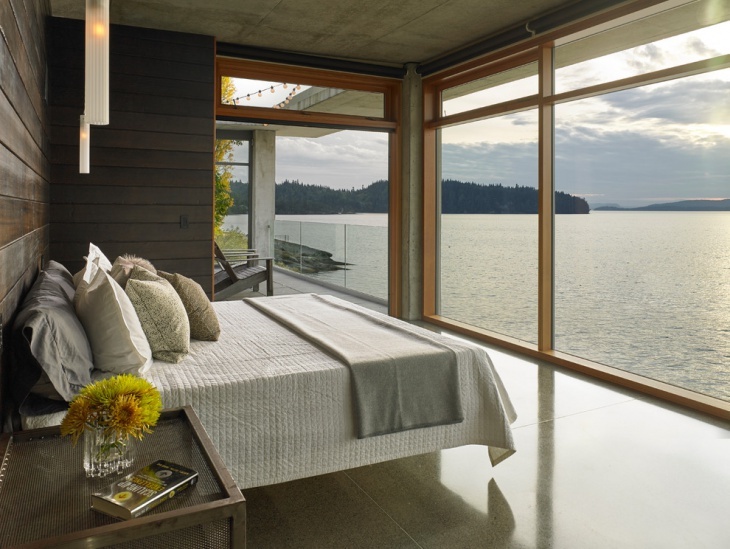 Concrete flooring is a bold and dynamic go to option you can choose for your bedroom space.Let’s have a look at some of the best Concrete bedroom designs. This modern bedroom has the ideal contemporary touch to it, and at the same time, it maintains the warmth of the everyday life. 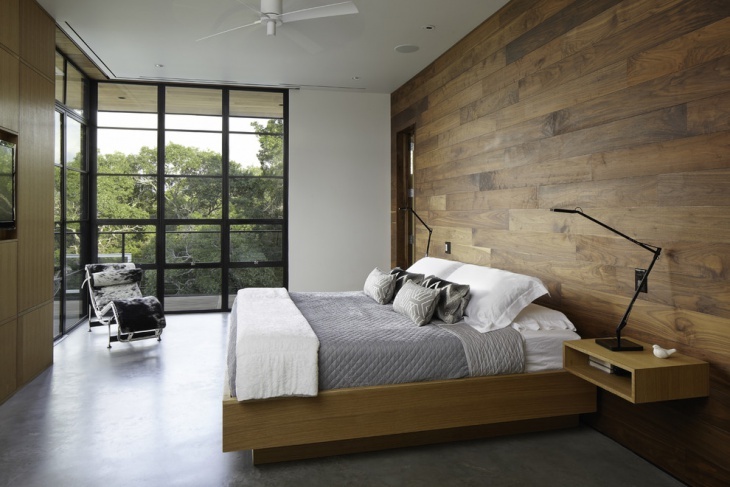 With the usage of concrete flooring and gray walls, the look of the modern bedroom is completed. 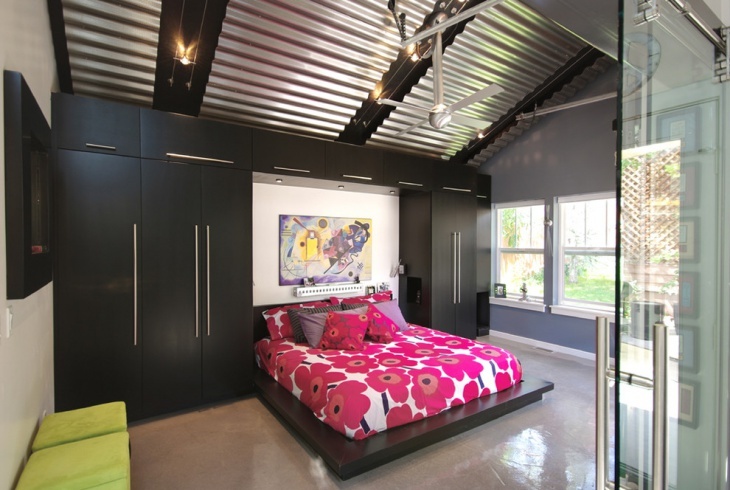 This contemporary styled bedroom is compact and cozy. 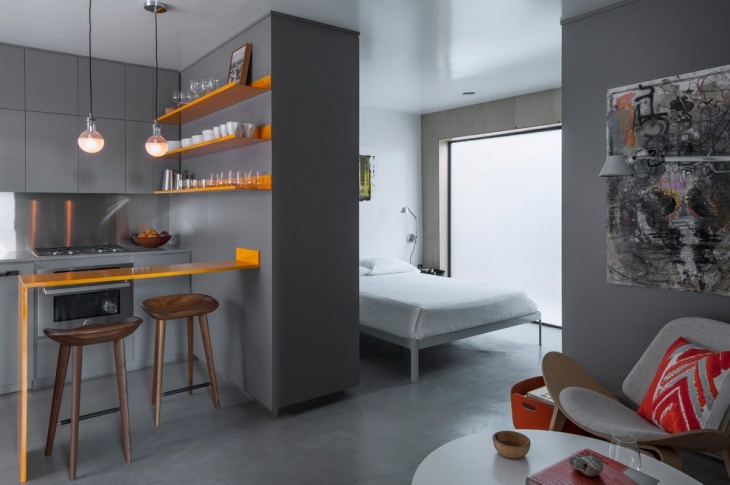 A wall divider between the room and kitchen exists, the tints of orange and gray is rather unconventional and quirky. This is a small space bedroom and is ideal for small families. 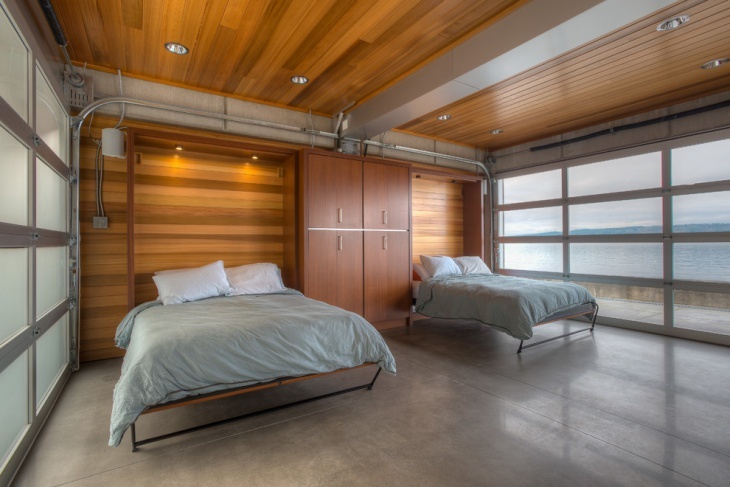 This awesome bedroom with wooden ceiling has Murphy beds that are foldable, it contains wooden ceiling along with wooden roll-up doors. The wall cabinets which are made of wood are built in and has a concrete floor. 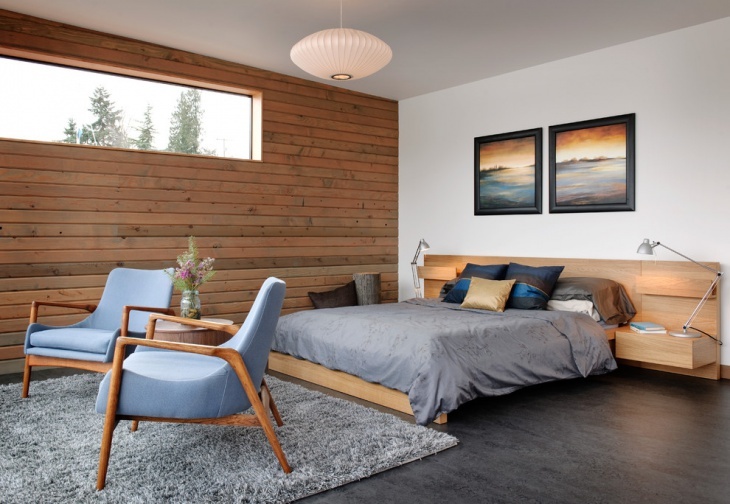 This simple bedroom has low lying furniture with wood panel walls on one side, and a white wall on the other. The colors used in the interior and décor provide a cool and comfortable space. 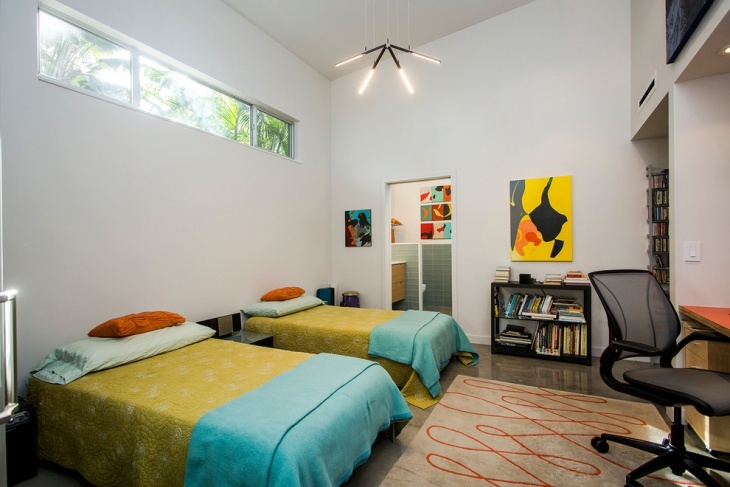 This creative bedroom has polished concrete flooring along with a wall that divides the dressing area within the room. It is a modern design room that allows for a lot of natural light to seep in through and the bathroom is incorporated within the room. This beautiful and luxurious bedroom contains a decorative wall in dark brown with intricate details. 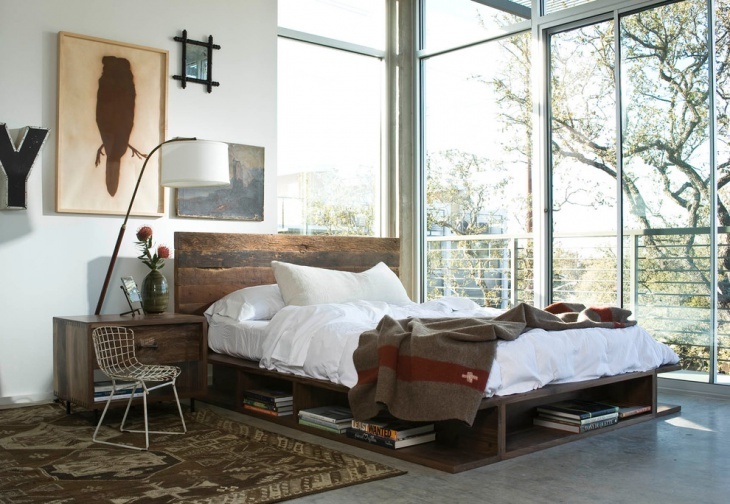 It features a king sized bed with built-in bedroom cabinetry, a free standing room divider, and ceiling light fixtures. This lavish bedroom features the riverside view and it is absolutely breathtaking, gives you the feel of a true vacation and adventure. 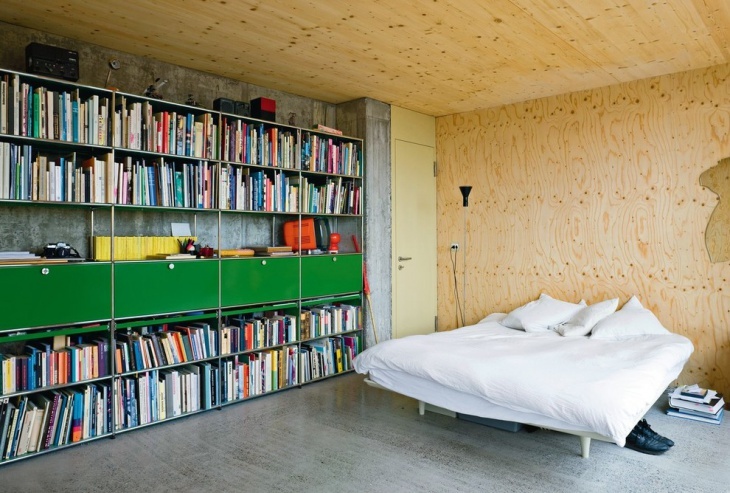 The walls of this bedroom arewooden and the flooring is concrete. 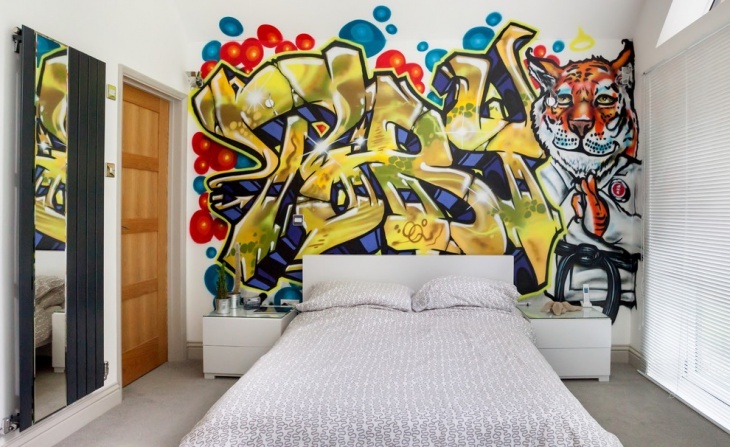 It is a beautifully designed bedroom. A combo of white and brown, this unique bedroom is large and spacious enough to be called as an ideal master bedroom. 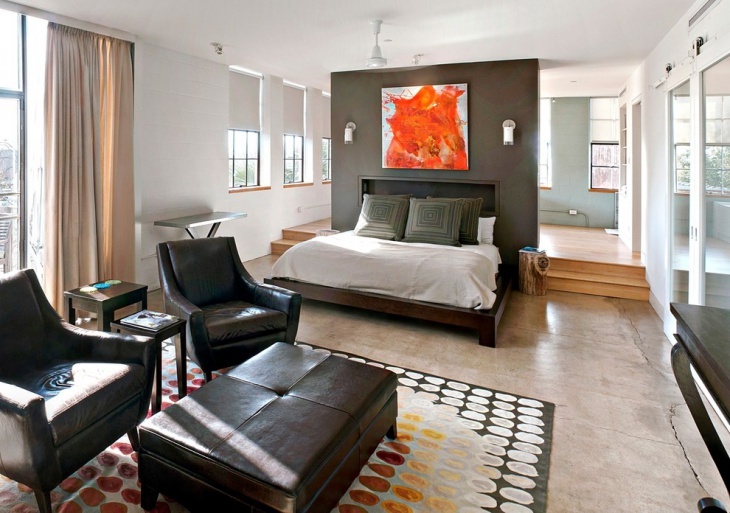 It features brown leather chairs, a king sized bed, chocolate brown walls, and a concrete platform flooring. 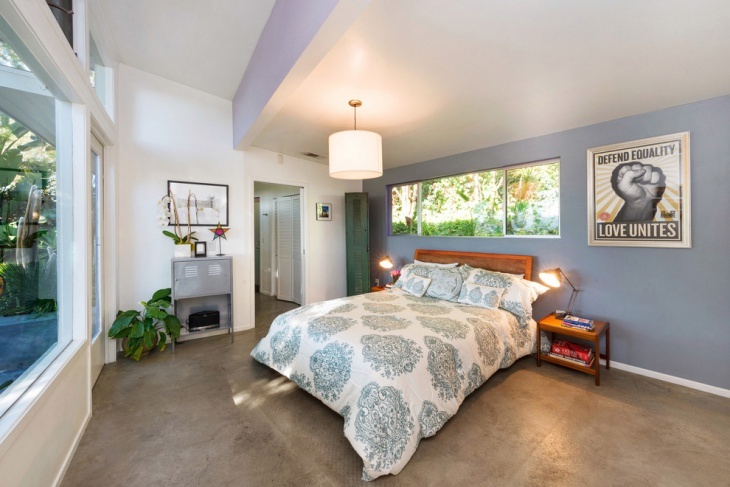 This mid century bedroom has a medium sized bed, blue walls, and concrete flooring. A lamp lying on the ceiling gives this room comfortable vibes and a serene lighting ambiance. It has the minimalist décor and furniture which makes this room a simple and elegant one. Black and white have always been the ideal vintage colors and when these colors are incorporated in a bedroom, they create a classy space. This bedroom has a white brick wall and black and white décor that is ideal for anyone who like the theme of black and white in their bedrooms. 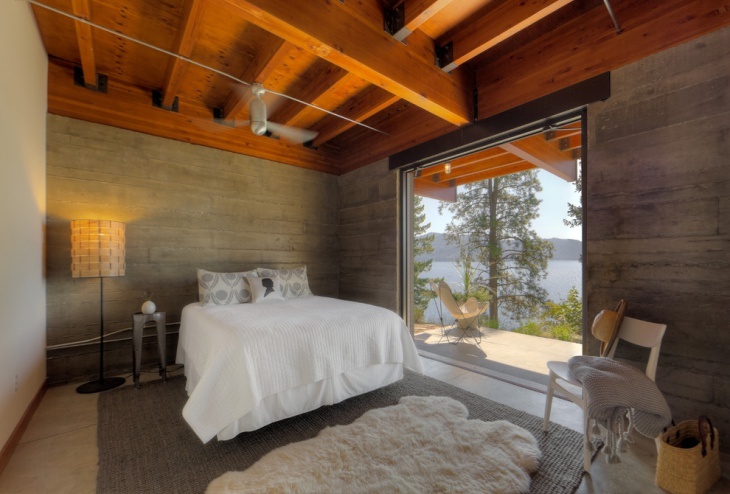 Concrete bedroom designs are bold and classy! They are unconventional and stand out from the rest. 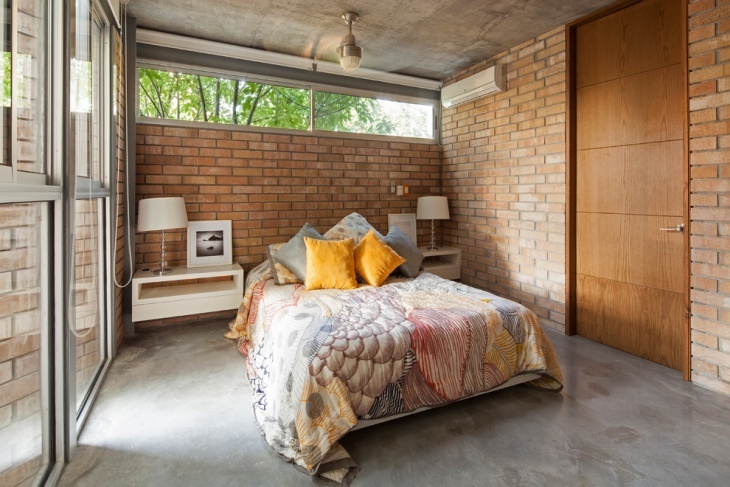 Today, a number of people are opting for concrete flooring and wall designs when it comes to their bedrooms as it not only holds a vintage, mid-century touch but is also slowly gaining the ‘contemporary’ tag as they come in modified versions.